Celebrity chef Gordon Ramsay’s attitude towards veganism has shifted radically over the years. For most of his career, he’s been well-known for the his hatred of vegans and vegan food. 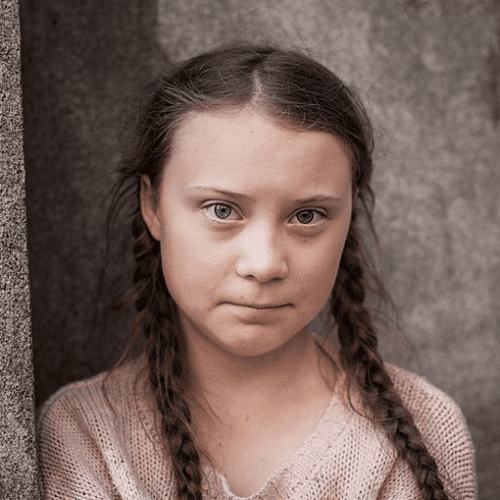 But significantly, even the man who famously said he was part of PETA – ‘People Eating Tasty Animals’ – has been forced to adapt to a changing market, with millions taking up a plant-based diet in the UK alone. Back in 2005 when veganism was a blip on the radar compared to today, Ramsay hit the headlines when he tricked a vegetarian to eat meat. 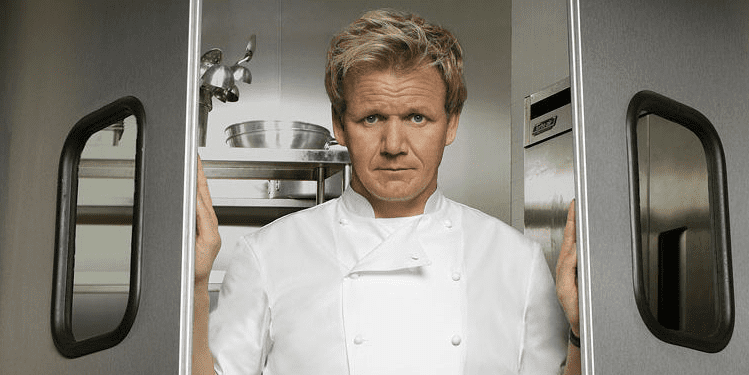 On his show Ramsay’s Kitchen Nightmares, the celebrity chef offered a pizza sample to a volunteer at Italian restarant La Lanterna in Letchworth, Hertfordshire. He told to the vegetarian volunteer the pizza was vegetarian. But once he took a bite, Ramsay said: “Unfortunately, that pizza has got a lot of mozzarella and tomatoes, but underneath all that there is parma ham. Ramsay followed up the prank by laughing at the man and asking him if he would like to eat more. The trick unsurprisingly infuriated vegetarians, describing his actions as offensive and unethical. And in an interview to promote the BBC’s Comic Relief programme in 2003, he was asked about his most recent lie. 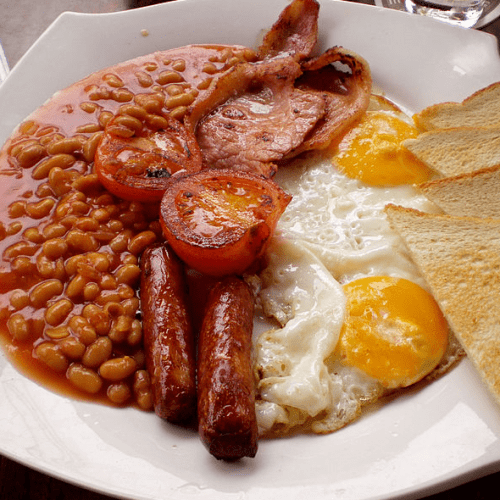 The Telegraph reported his reply: “To a table of vegetarians who had artichoke soup. I told them it was made with vegetable stock when it was chicken stock,” he replied. 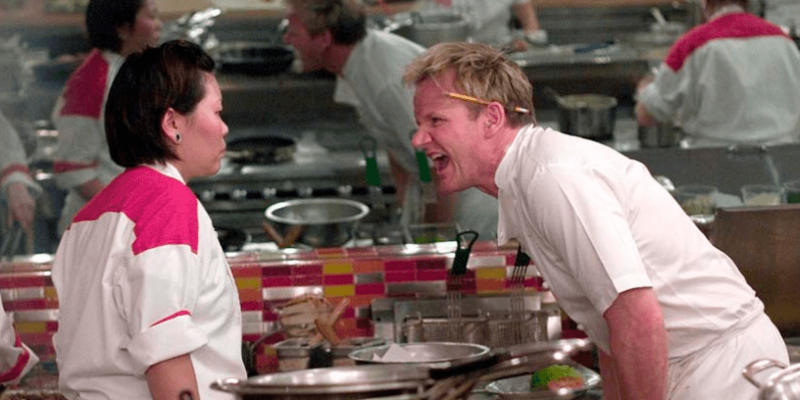 Two years later in 2007, Ramsay again revealed the extent of his distaste for vegetarians. He said in an interview with Daily Mirror: “My biggest nightmare would be if the kids ever came up to me and said ‘Dad, I’m a vegetarian’. Fast-forward to 2016, and his views had barely changed. When asked by a fan about his allergies, Ramsay immediately replied with the one word answer: “vegans”. The original tweet has since been deleted. 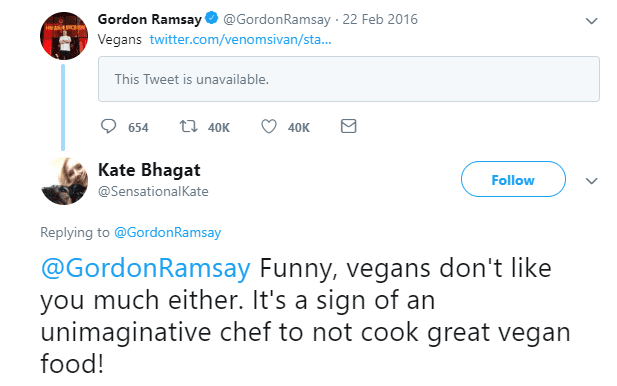 Vegans were quick to put the celebrity chef in his place for the petty comment. Ramsay has often taken to Twitter to put down veganism and animal rights activists. And the outspoken chef also took a dig at People for the Ethical Treatment of Animals (PETA) as recently as February 2018. 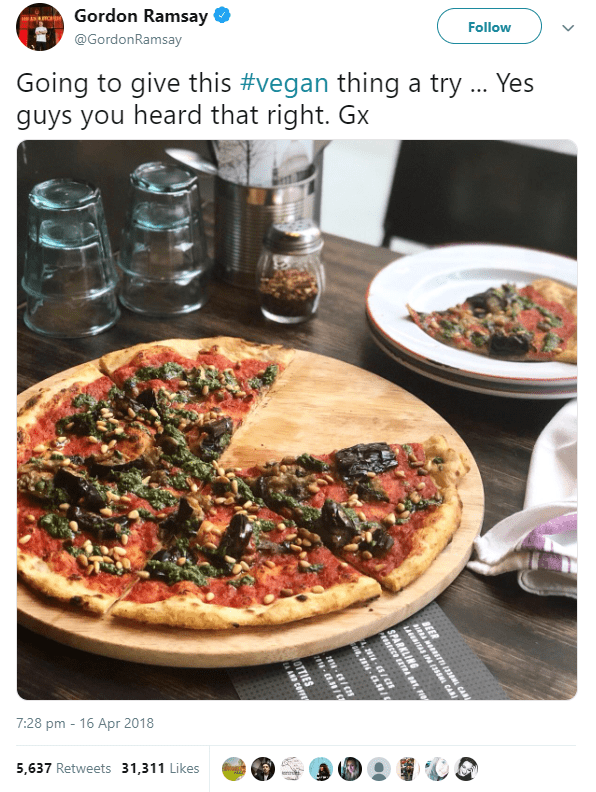 This was at first criticised as being simply a marketing gimmick for a vegan pizza launch in his restaurant, but it was still hailed as a sign of the growing influence of veganism. And once Ramsay dipped his toe in the vegan water, he couldn’t turn back. Just a few months later on June 2018, he took part in the first ever vegan Masterchef cook-off. Ramsay appeared to have changed his scathing mindset towards a plant-based diet when he invited vegan actress Madelaine Petsch for a one-on-one vegan Masterchef mystery box challenge. 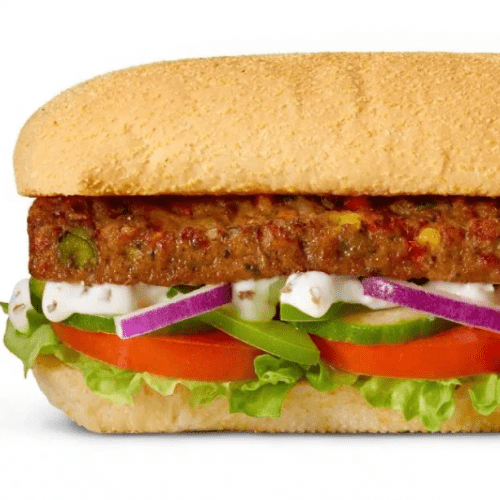 As Veganuary grew rapidly in popularity, expanding to more than 250,000 participants in 2019, he was forced to take notice. 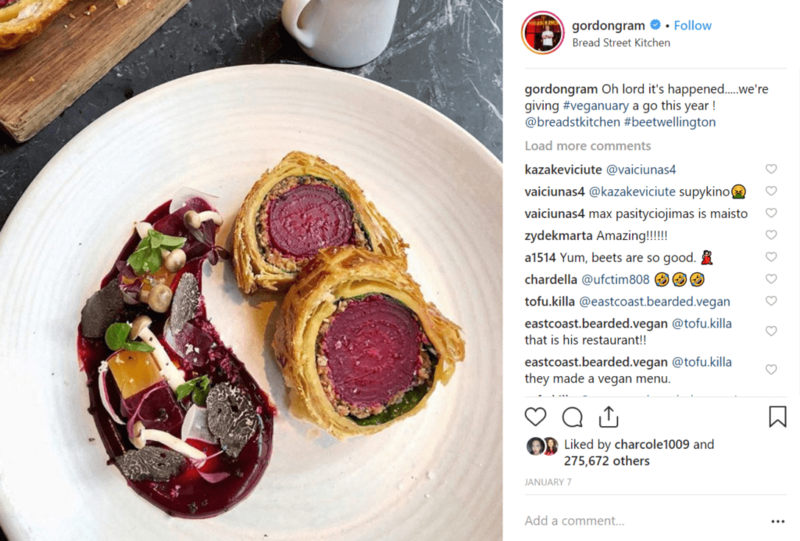 The chef reluctantly introduced a vegan menu specifically for January 2019 to his London restaurant Bread Street Kitchen. 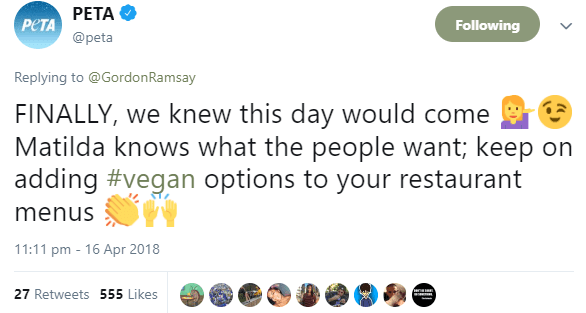 For whatever reason, whether it’s driven by ethics, fame, money or popularity, Ramsay has drastically changed his approach to veganism within the space of one year. As one of the world’s most famous chefs, this can only be a positive for the vegan movement. What do you think of Gordon Ramsay’s drastic shift? Tell us in the comments section below!